The St. Andrew's-Sewanee varsity mountain biking team concluded its fall season over the weekend of November 1-2 in the state championship race for the Tennessee High School Cycling League. SAS hosted the race on its campus trails, with 68 riders from ten schools including independent riders competing on Sunday in cold but sunny weather conditions. Twelve SAS riders raced in graded categories, with the junior varsity group riding 15 miles and freshman and sophomore groups completing 10 miles. The course was the most physically demanding of the race season, and included technical rocky sections, a large grass section, and several challenging climbs. SAS rider Ashton Milford retained her season leader's jersey by finishing first in the sophomore girls' race; she also earned the state championship title in her division. Abby Mainzer stood on the podium for the third time this season after riding to a third place finish in the junior varsity girls' division. Senior Namkha Norbu raced ahead of two other riders to earn fourth place behind Mainzer. In overall season standings for the Tennessee League, Mainzer finished in third place and Norbu finished in fifth place in the junior varsity group. Twenty-two riders competed In the junior varsity boys' division. SAS senior Fields Ford rode his fastest race of the season to earn a spot on the podium in third place, while also finishing fourth in overall season standings for the league in the junior varsity group. Senior Matthew Baranco recovered from a crash late in Sunday's race to finish in 11th place; Baranco also earned fifth place in overall season standings. Colburn Hassman and Joshua Alvarez battled neck-and-neck in an exciting finish line sprint to 14th and 15th places, respectively, in the junior varsity group, while Filip Martyni-Orwenowicz finished in 18th place. SAS team members Fritz Stine, Crawford Emory, and Andrew Bachman raced with eleven other riders in the very competitive sophomore boys' division. Stine earned a sixth place finish, with Emory and Bachman racing to eighth and tenth place finishes, respectively. 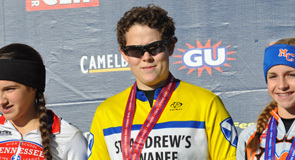 As the youngest SAS rider, Matthew Mollica raced in the freshman boys' division to earn sixth place, his highest finish of the season. In final rankings for the Tennessee League's second race season, St. Andrew's-Sewanee earned second place behind Marshall County (KY) High School. The SAS varsity mountain biking team is coached by Speed Baranco, Beth Pride Ford, and Rob Bachman. The coaches are grateful for support from our team parents, the SAS community, Crossroads restaurant, and Woody's bike shop. As a final note, high school mountain biking is becoming a popular sport in the Southeast. Georgia and Alabama are new league members in the National Interscholastic Cycling Association (NICA). After two seasons the Tennessee League has grown with the number of riders has increasing by 20 percent from 2013. Future growth for high school mountain biking will require community awareness and participation, trail accessibility, and financial support from individuals and businesses. More information about how to support high school mountain biking can be found on the national website, www.nationalmtb.org. Community members and local businesses interested in sponsoring the Tennessee league may also find information at www.tennesseemtb.org.